​Kawhi Leonard's reign in San Antonio came to a bitter end in 2018. Leonard and the team disagreed on how to handle his injury and the star only ended up playing in nine games during the season. Leonard was ready to be traded, so coach Gregg Popovich and Co. obliged. It seemed the bridges were fully up in flames. But according to the latest reports, that doesn't seem to be the case anymore. 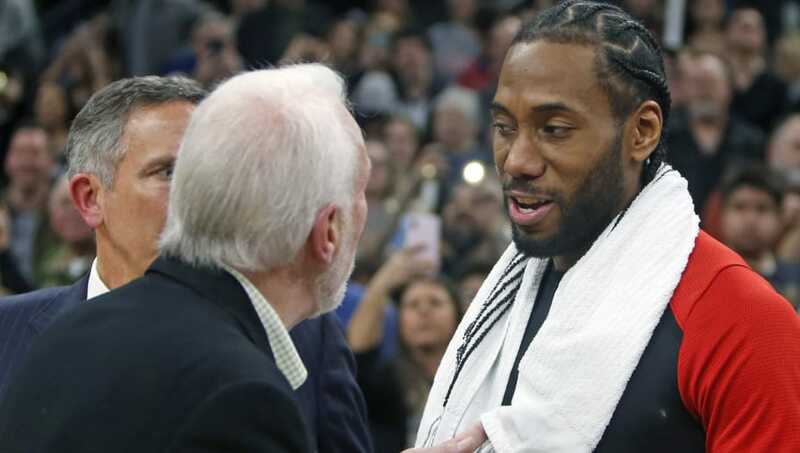 ESPN has said that the ties between Leonard and ​Popovich are far from severed. Apparently, the two text regularly. ​​Of course Leonard only texts. Could you imagine him on a phone call? The thought of the awkward silences has my skin crawling. Oof. When asked about the relationship, Scottie Pippen told ESPN, "They won a championship there. He was the MVP. And as Pop said, sometimes in your career things go differently." Pippen is correct. Despite being booed by the entirety of the AT&T Center when the Raptors played the Spurs at home this past week, the team still showed its love. ​​Leonard and Popovich were seen hugging and talking privately after the game. They have history. They worked together for years. They won a ring. That's a bond that will never be broken. Sometimes things just don't work out. There's no need to hold resentment, and the two know that. They're professionals. Maybe Spurs fans should ponder that next time.